I’ve mentioned that I was gifted twelve boxes of fabric several years ago, of which I kept about a quarter of the fabrics and passed on the rest. Having been in tight financial circumstances for most of the time since, it has been a welcome addition to my stash. When I needed a new skirt for church, a piece of plaid mystery fabric (possibly a cotton/poly blend) was just large enough to become a full, rather 50’s looking skirt. The skirt is made up of two straight panels, pleated to a waistband. It has a pocket in the right seam, and closes on the left with buttons and buttonholes in the waistband – I can’t be bothered with zips in this full kind of skirt, the placket is mostly hidden in the folds anyway. The hem is finished with a deep facing of dark blue cotton, as I think it gives a nice body to it. I’m sorry about the poor quality of the images, light indoors in winter isn’t the best (especially not when facing the windows – but I wanted a shot with the Christmas tree before we took it down), and we didn’t have time to go outside for pictures. Bit annoying, as I had taken the trouble of curling my hair, but Baby was hungry and very tired, and he has priority over photos. 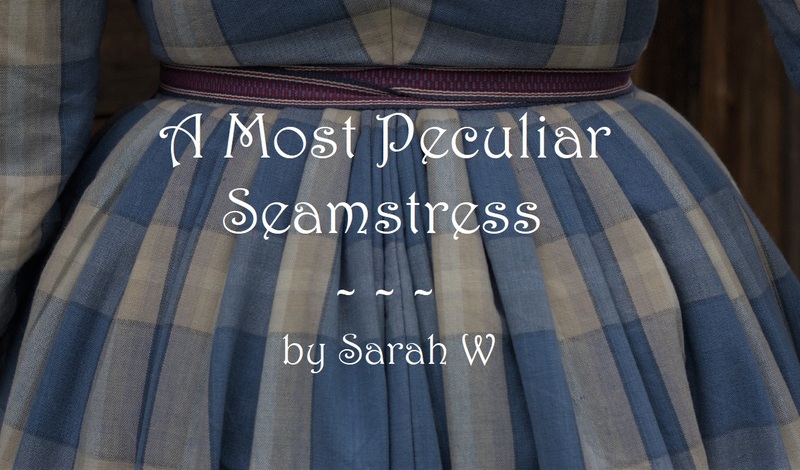 The plaid is mainly navy, white and black, with narrower forget-me-not blue, bottle green and custard yellow stripes. And with that, my sewing year has started! We’ll see if it gets more productive than last year was.